Every day the trees wake up, watch the sunrise, and spread their leaves to capture the energy needed to live another day while storing excess energy away so the tree makes it through the winter. Trees, and other plants, have done this for millions of years. It is a natural cycle of life that we as modern humans seem to have forgotten. Instead we rely on dead energy sources without seeing ahead to when that energy runs out. The failure to plan ahead may eventually doom modern humanity to a return to stone age living, eking out survival among the ruins of mega-cities that were once the gleaming hope of mankind. That’s what I thought last night (April 23, 2016) listening to Bertrand Piccard as he stepped out of the Solar Impulse 2 aircraft at Moffett Field in the heart of Silicon Valley. 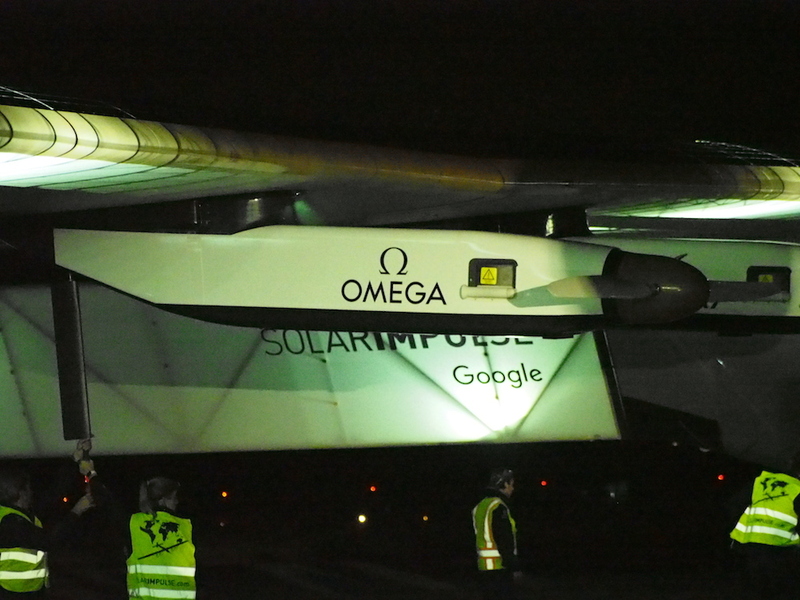 It is a solar powered airplane that can theoretically fly for years at a time. Well, if it wasn’t for the human being on-board and his need for continued food and supplies. The Solar Impulse 2 is solar powered – meaning that almost every surface on the airplane is covered in solar panels. That solar array gathers enough energy during the day so that the airplane can fly to the same altitude as Mount Everest – 30,000 feet – while storing away enough energy so it can fly all night long. The total is enough energy for the Solar Impluse to just keep on flying, and flying, and flying. Yesterday morning while approaching San Francisco, Piccard joked about how he didn’t want to land but just wanted to keep flying. He’d just received his pilots briefing from mission control in Monaco, and they noted he had another 17 hours of flying time ahead of him before the scheduled landing at Moffett Field. Piccard observed how hearing of 17 hours flight time remaining would terrify regular pilots, observed it was so nice not having to rely on fuel. 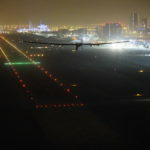 That’s the point … the Solar Impulse aircraft does not rely on FUEL. Meaning, it does not carry a limited bank of energy that can only be refueled on the ground, or from a tanker aircraft. Instead, it gathers an excess of energy while it’s flying during the day, and has more energy than it needs to continue flying all night long. What if our whole society was fueled in a similar way? What if instead of burning dead material to diminish a fixed size bank of energy (the sum total of coal, oil and natural gas resources), we gathered new energy every day from sunlight? What if this was the norm rather than the exception? It’s very important that we all have an appreciation for this model. How it works is very simple? 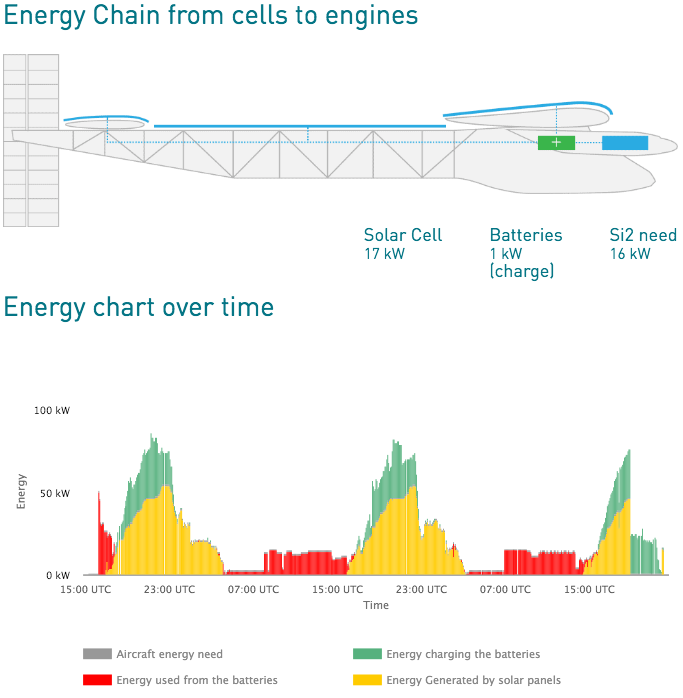 We can demonstrate it with a few graphs published on the Solar Impulse website. Here they graph energy capacity (as a percentage of total) over the trip, as well as altitude. You’ll see night-time cruising altitude is at 5-6,000 foot altitude, while during they day the airplane climbs to over 30,000 ft. Since the cabin is unpressurized, it means that above 15,000 feet Piccard is wearing an oxygen mask. 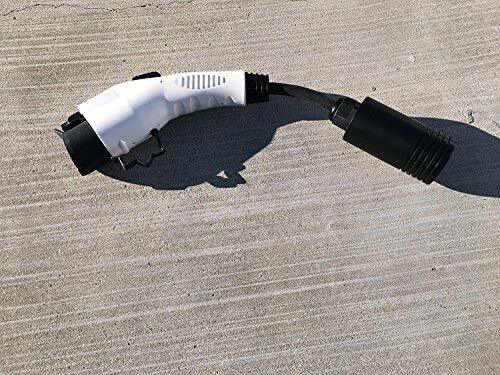 Likewise energy stored in the battery pack drops to as low as “25%” at night – that’s the lowest you’d want to safely take Lithium-ion batteries – and climbs to 100% for a goodly portion of the day. It means that, like an electric car, the Solar Impulse has a battery pack. 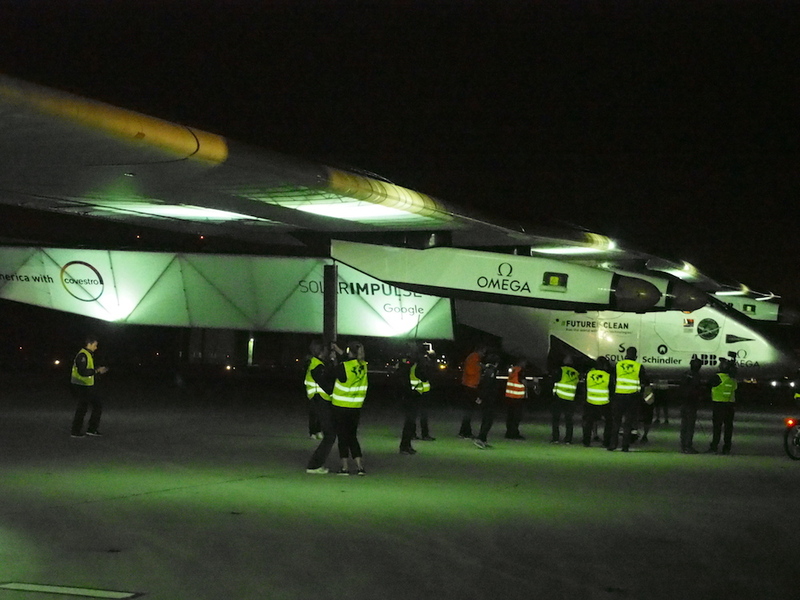 The pack has to be sized to hold enough energy for the night-time flight, and the solar array has to be sized to supply enough during daylight hours (about 10 hours) to power the Solar Impulse all day and all night. Here we have some numbers – 50 kW is peak energy production from the solar array. That’s a sizeable array, about 10x what is on a typical home solar system. 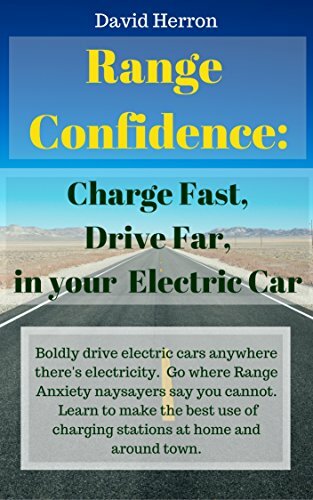 Energy consumption to drive the aircraft appears to be 20-30 kiloWatts. This image was captured while Piccard was circling around the Golden Gate Bridge and Alcatraz Island for a photo-shooting-opportunity. 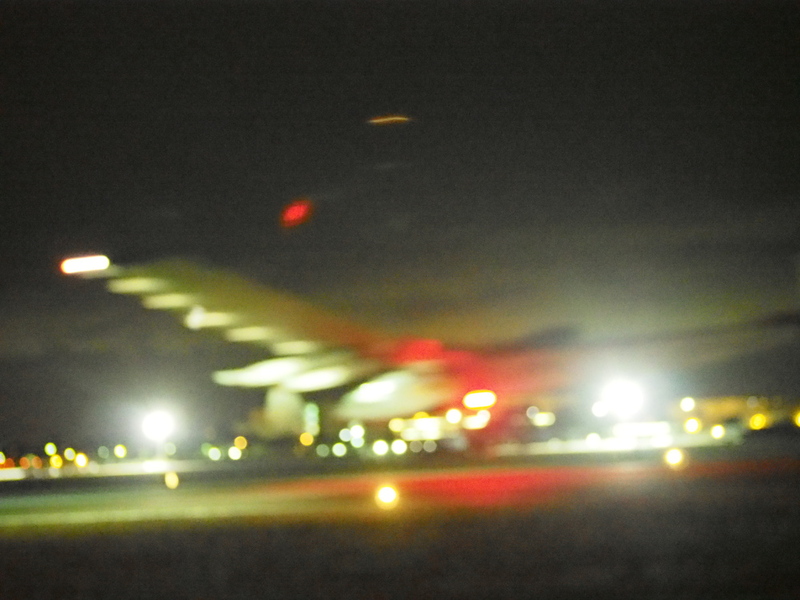 At that time they still had almost 8 hours of flight time remaining before landing. 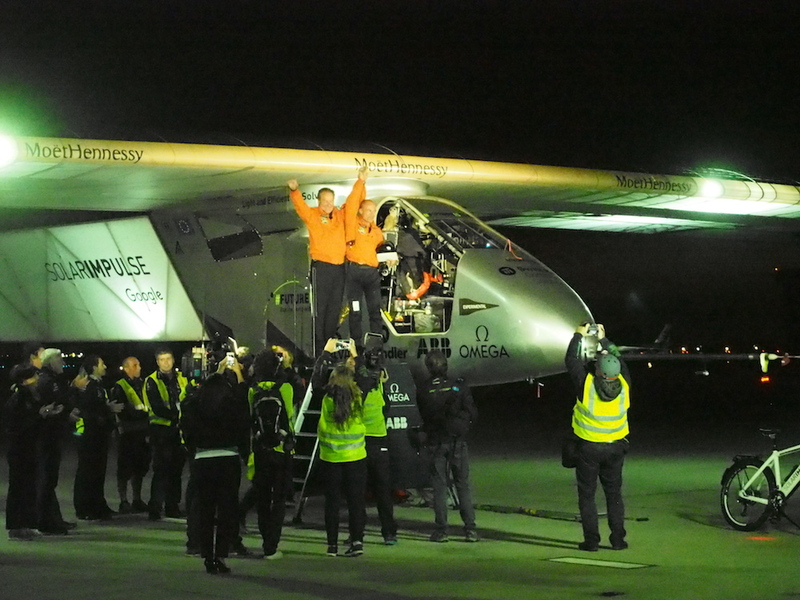 The aircraft had produced over 600 kiloWatt-hours of energy during the flight, over a 2+ day period, flying more than 4000 kilometers, over the ocean. The battery pack had started that morning at 25% remaining capacity, and at the time I captured this the State of Charge was at 100%. Let me say again — if we can all just grasp the significance of that — our future is indeed clean. 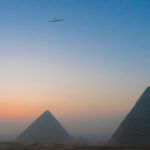 What’s the Solar Impulse? Where’s it going? WTH? That was interesting heady stuff to think about, but we have some basic education and facts to go over as well. The Solar Impulse aircraft was thought up by Bertrand Piccard over 15 years ago, following his around-the-world flight in a balloon. 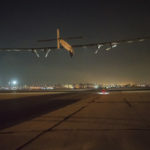 The idea was to fly around the world while consuming no fuel, and to use that flight as the launching pad to discuss energy paradigms and inspire clean energy technology development. 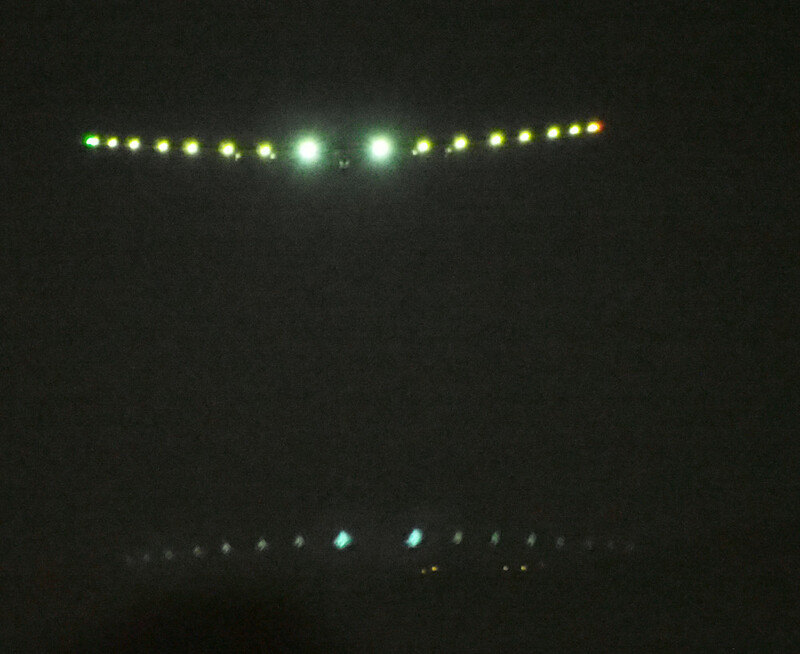 The Solar Impulse 1 started flying in early 2010. The team took several long distance flights, first in Europe, then to Africa when it flew around Morocco, and then finally across the USA in 2013. That airplane had four motor nacelles, running at 10 kiloWatts apiece, and about 85 kiloWatt-hours of energy storage split across four packs. The Solar Impulse 2 has a larger pilot cockpit, a larger fuselage, a somewhat different arrangement of motor nacelles on the wings, but I don’t have specifics for the battery pack to know if they increased its size. Flight speed for the SI2 is about 28-30 knots. The goal has been, all along, to make an around-the-world flight using the energy model just described. 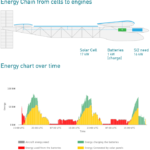 Since the flight speed is very low, and due to weather considerations (the Solar Impulse has to fly in excellent flying conditions), the flight is split up into multiple segments that will span the globe. If the plane were to fly around the world in one go, it would first need to be much sturdier to withstand serious weather considerations, and second be designed to have at least two occupants, and a passenger cabin large enough for a flight involving 2-3 weeks of flying time. Instead, they’ve designed it so the longest segment is 5-7 days. The flight began a year ago in Abu Dhabi, and would have completed last fall. Unfortunately during the flight from Japan to Hawaii there was a snafu, and the battery pack overheated and became damaged. 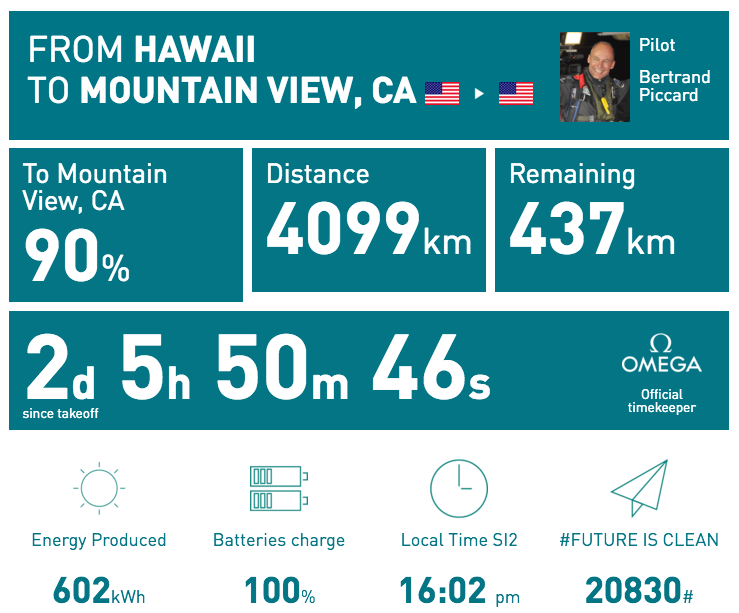 That necessitated leaving the Solar Impulse in Hawaii over the Winter while the team built a new pack and performed other repairs. The flight segment just completed is the resumption of the 2015 flight. Plans are to take off from Moffett Field as soon as possible, perhaps next week, and to fly first to Phoenix Arizona. 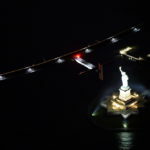 From there the plan is to reach New York City, and then fly across the Atlantic to Europe. There may be one or more stops somewhere in the mid-USA depending on weather conditions. Likewise there may be one or more stops in Europe depending on conditions. 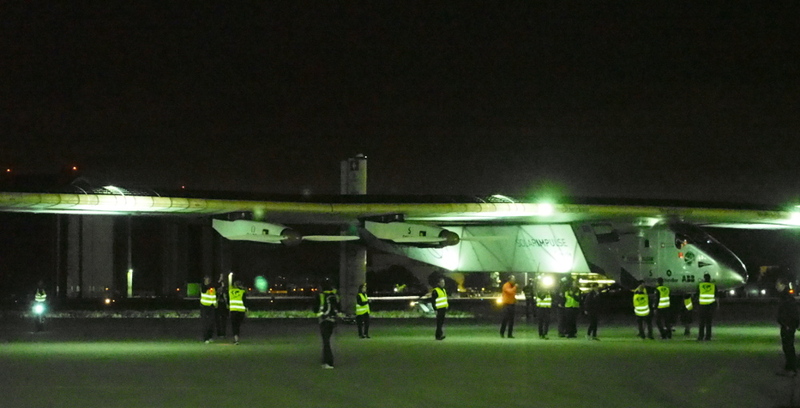 Upon arrival the Solar Impulse was wheeled into place in-front of a crowd of about 400+ invited guests, and about 50 Media. The Media/press was in front, where we were taking pictures and conducting interviews. It takes a whole crew of people to wheel this airplane around. 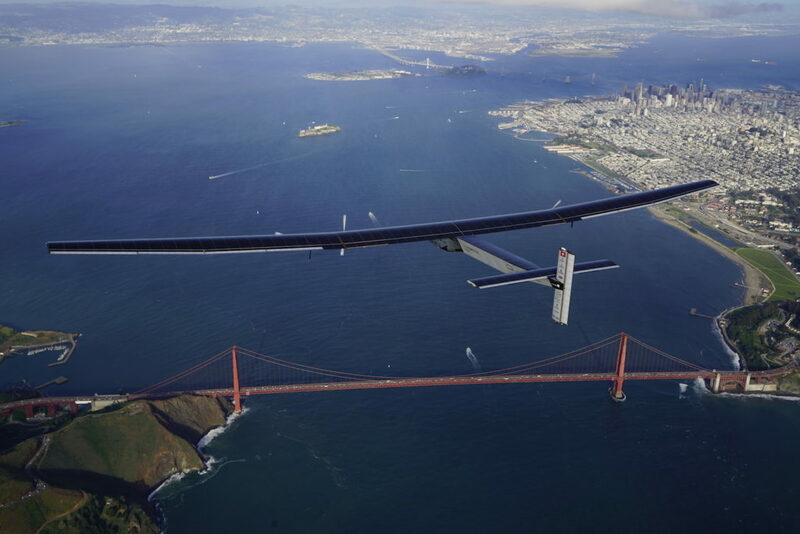 Bertrand Piccard and Andre Borschberg co-founded the Solar Impulse project years ago. Notice his stubble, probably not much time for shaving while flying. 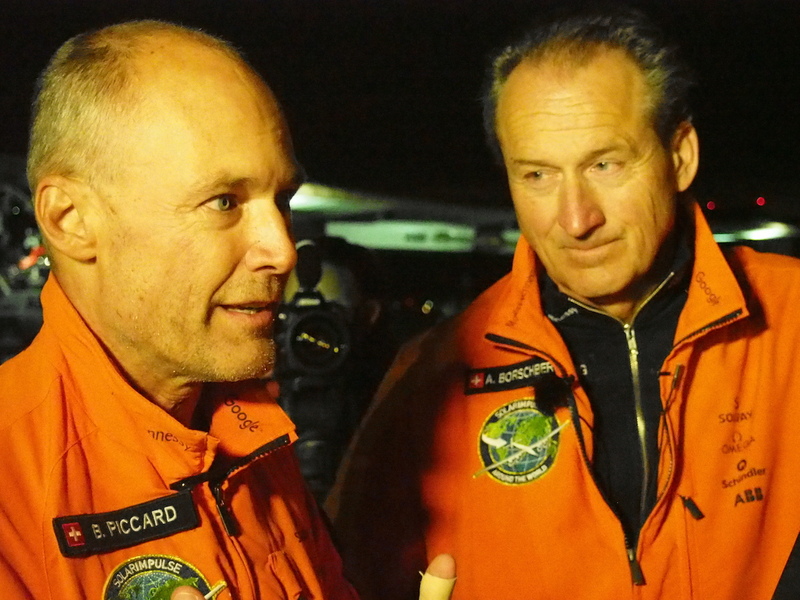 Bertrand Piccard seemed alert and happy even after sleeping very little for the last 3 days. EV Airplanes, Solar Impulse. Bookmark. Next year will we be fighting President Clinton on Fracking and ill-advised Regime Change?